It is common to the knowledge of historians that Egyptians took immense care in their appearance. They took pride in their beauty. Clothing also indicated the social status of an individual. The hot and humid climate of Egypt obviously had influenced their way of dressing. This was the reason why they wore little or no clothes at all. Clothes were mostly thin and light. Egyptians preferred mild clothing made from plant fibres. Mostly the clothes were made of linen which is made from a plant with blue flowers called flax. White linen needed constant washing. It was washed in the river or canal, rinsed, then pounded on a stone, and, bleached in the sun. Cotton and wool were often used, though not extensively. Wool was considered unclean. 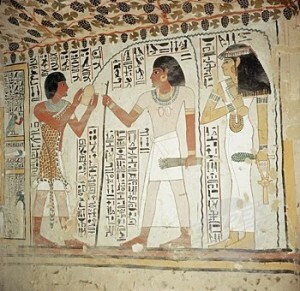 As traces of silk have been found in Egyptian tombs, it can be assumed that silk was also worn. Some silk were traded with Asia from 2000 BC.Animal skins, especially leopard skins were prevalent mostly by priests and Pharaohs while performing their sacred duty. At times kings and queens wore decorative ceremonial clothing adorned with feathers. In Ancient Egypt, women were predominately in charge of textile manufacturing and garment making. Garment making was a household chore, but the woman also worked for aristocrats in spinning and weaving shops. The tools involved in garment making include knives and needles, both of these needed to be moulded, shaped or craved. The types of tools used changed over centuries. Needles were made from wood, bone and metal. Men wore their hair short, and shaved their beards and moustaches, while women wore their hair down to their shoulders. Heads were not covered. The wealthy men and women wore long see-through robes. Better off people wore wide white clothes. They wore gold jewellery. Workers wore loincloths made of animal hide and linen. They also wore simple tunic dresses. Most of the slaves worked naked. Working women mostly dressed in a short kind of Kalas iris. Men doing physical labour wore a loin cloth, wide galabieh-like robes or if they were working in the water, nothing at all. Women did not dress without washing. After washing, they rubbed themselves with scented oil then they placed a large rectangle of linen over their heads, gathered the loose corners up and tied them in a knot below the chest. The usual toilet articles were tweezers, razor and comb. Everyday clothing was mostly undecorated and whitish though pleating was known since the old kingdom. Cleanliness was very important to the Egyptians. Manually washing clothes was hard work. Soap was unknown to the ancient Egyptians, so lye made of castor-oil and saltpetre or some such substances or detergents were used. The laundry was beaten, rinsed and wrung by pairs of workers. Wealthy people adorned themselves with jewellery made of gold and precious stones. Bracelets, Ear rings, Rings and anklets were used. Ordinary people wore necklaces made of brightly coloured pottery beads. Both men and women wore wigs. They made up their eyes and lips.